I always have great plans for preserves and jamming as much of my produce and foraging as possible as the seasons roll around but last year everything well to hell in a hand basket as life stopped for our RHS Tatton Show Garden. In theory it was only July but in practice it was most of June and a goodly portion of August to. Consequently the currants didn’t get much love and the week before decamping to Tatton I simply took off the super protective netting and let the birds have their fill of what was left. The pickings were bundled into a 5p bag and shoved unceremoniously into the bottom of the freezer. I could have used them before, would have made sense to run some wobbly jelly up for Christmas but no I let them wallow in the cold. Inspired by the sunshine and freezing weather – who says that?! – I started unpacking the freezer and making some use of the goodies still taking up space. I suspect I was also a bit (VERY) inspired by Alys Fowler’s Edible Garden series on at the crack of dawn on a Sunday atm! 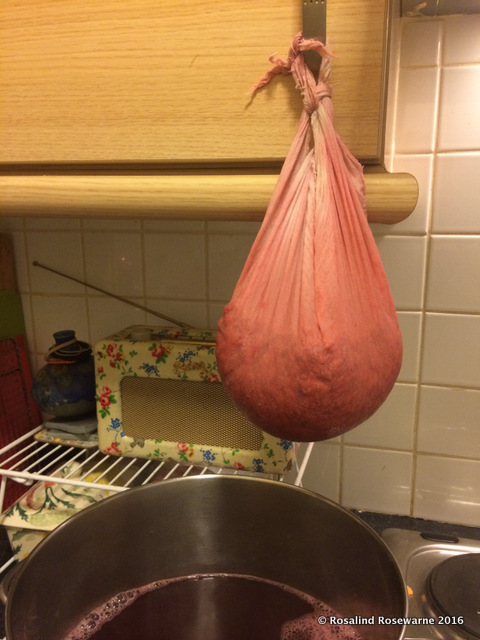 As ever I googled a recipe and it was much like making Crab Apple jelly and Medlar Jelly although having let most of that boil over I was MUCH more vigilant. I think I am beginning to get the hang of this jelly lark so may not even google recipes next time, just wing it with the sugar! I weighed about 3.5kg of currants, some white currants and the odd black currant had sloped into the bag but I didn’t fuss over getting them out, nor the stalks at first. All frozen together. 4ltr Water, enough to cover fruit in pan. 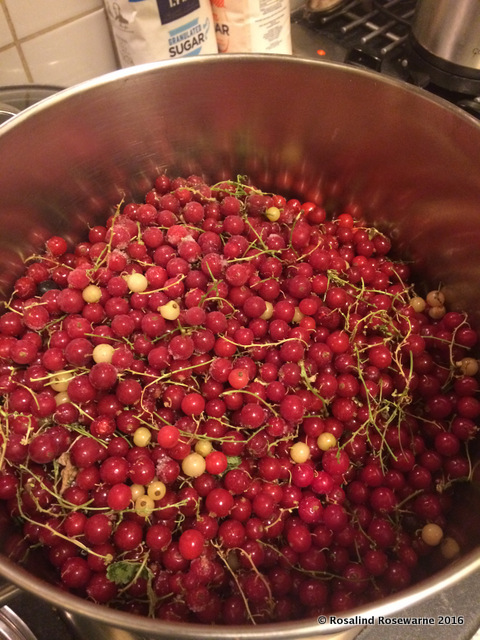 Place the currants, stalks and all it in a large heavy bottomed pan, cover with water and bring to the boil. I scooped out stalks and the odd leaf as it floated to the top, I could/should have cleaned them before freezing them but this worked ok. Turn the heat down and simmer on a low heat for 20 mins. The berries go to mush and the water takes on a ruby red colour. 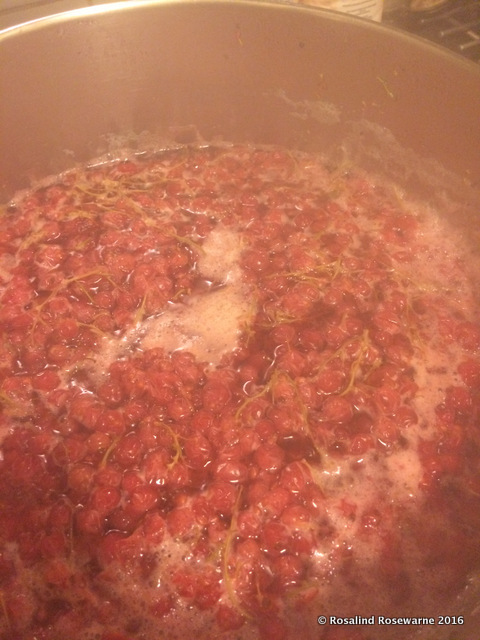 Beautiful boiling berries and the odd stalk! Allow to cool slightly, for handling, and pour mixture into/through a muslin cloth (or a jelly bag if you have one) suspended over another bowl, I use two other bowls, or a large pan. Bowl with big holed sieve lined with muslin to strain the hot berries and juice mixture. 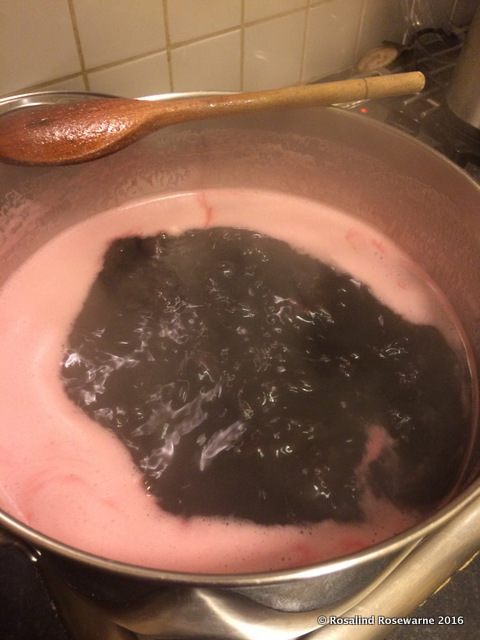 Leave overnight to drain DO NOT SQUEEZE the muslin or the resulting jelly will cloud, unlike crab apple resist the urge to squidge even if you like cloudy jelly. I tie mine to the cupboard door. 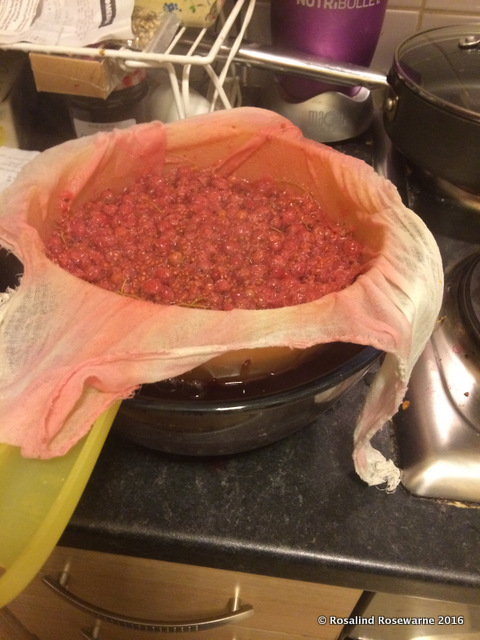 Muslin bag dripping over pan – NO SQUEEZING! Once draining is done, measure the liquid into a clean pan adding 700g sugar for every 1ltr of liquid. The higher % of sugar to liquid the firmer the set, some recipes say 1:1 sugar to juice, so it depends how you like your set. Bring steadily to the boil. At this moment put 2 saucers in the freezer and put your clean jam jars into the oven on a very low heat. Once all the sugar has all dissolved, and NOT before, bring it to a rolling boil. Once you hit 10 mins take the jelly off the heat and a chilled saucer out of the freezer and start testing for the set. Spoon a little jelly onto the saucer leave for about 2 minutes and the push your finger through the jelly if it wrinkles then it’s done! If not return jelly to the heat and keep boiling and try again in 5 mins. I rinse the plate and return it to the freezer. It usually takes me about 15-20 mins at this final boil stage but it all depends on how much pectin your fruit has so it’s not an exact science. Mine took 40 mins this time. What ever you do do not leave the pan unattended, as I did with the Medlar Jelly for a few minutes. DISASTER. As soon as you have reached set point take the jelly pan off the heat. Remove your jars from the oven and bottle your jelly immediately. Lids on asap and screw them tightly shut. Wait until they cool to label them. This made 11 x 1lb jars sorry I should know the metric equivalent but sometimes you just don’t…and the set is beautifully wobbly. It’s really good with cold meats and of course the usual roast meats and game. It has a wonderful ruby red colour and when held to the light looks like a jewel. It tastes a little sharp and sweet but is no where near as sweet as the shop bought versions. I’m hoping to explore variations in coming years, redcurrant and orange and red currant and mint have been mooted already.. Let me know in comments below if you have favorite combinations you’ve tried out.